If you’re visiting Progressive Field for the first time, here are a few tips for when you go. With the Cleveland nine back on top of the American League Central in recent years, they’re back to being a draw again…so plan accordingly. The one on the right hooks you up if you mention my name. 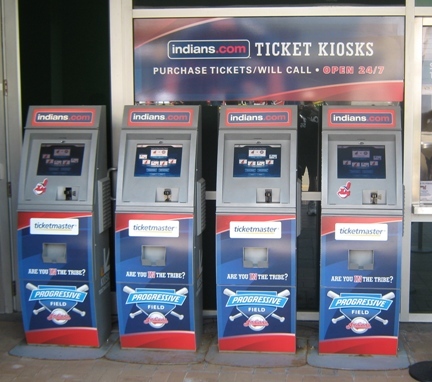 Visiting Progressive Field, Tip #1: Try buying tickets from the team first. The Indians, for the moment, still have some great offers especially for multiple games. They also employ “dynamic pricing”, and they claim that prices will be lowest when tickets first go on sale. That may be true, but given the increased demand, you should try to buy tickets through the team first. For mid-week games in April, you can probably still go to the box office on game day and avoid the considerable online fees. Sometimes whole sections of folks go for food. 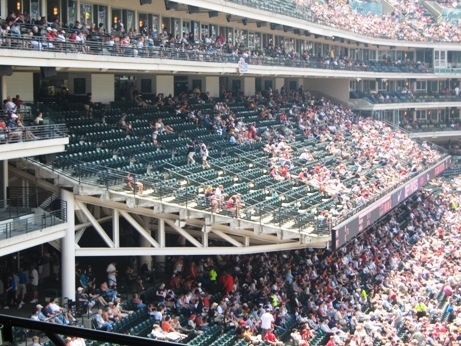 Visiting Progressive Field, Tip #2: Look into Club seating. The Club seats at Progressive Field are more expensive than much of the seating bowl, but they’re worth it; you not only get food and drink from several buffet stations included in the ticket, you also have access to the climate controlled concourse and its tables and bars…no small thing in a city that often needs climate control. The club seats are divided into three sections, so you can go for the ones closest to the outfield to save a few bucks. A free ride to the game? It’s my lucky day! 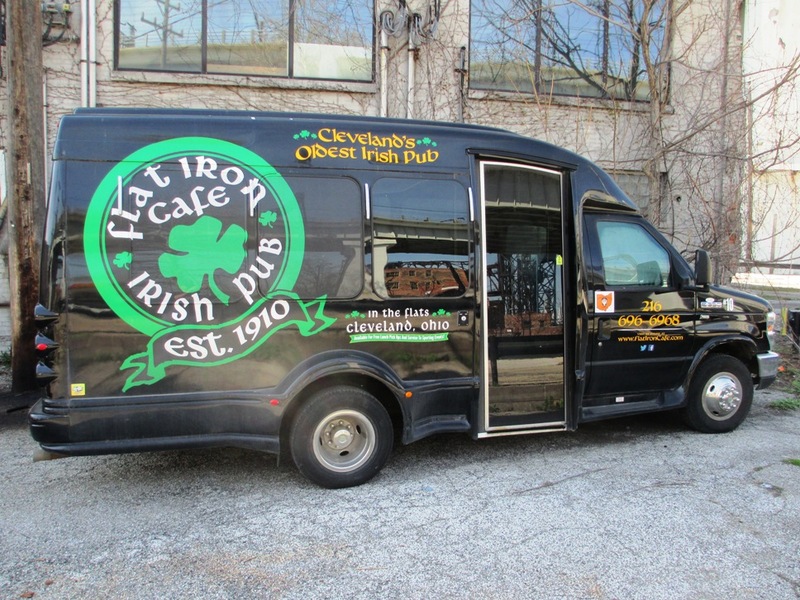 Visiting Progressive Field, Tip #3: Try an Ohio City shuttle. If you want to have a pre- or post-game drink, there are a couple of joints west of the ballpark that not only sell cheaper beer, but will also give you a ride to the game. Visiting Progressive Field, Tip #4: Eat at the game. Progressive Field has shot up the rankings of best ballpark food selection in baseball in the last couple of years, and the best part is how many great Cleveland institutions are represented there now. There’s the Melt grilled cheeses and the amazing Parmageddon sandwich, Barrio tacos, Ohio City Burritos, Fathead’s sandwiches, and that Slider Dog from Happy Dogs and many more. Finish it up with Sweet Moses ice cream. The food selection absolutely rocks at the Prog these days…bring a few bucks and an appetite. And share. Visiting Progressive Field, Tip #5: Enjoy Cleveland. 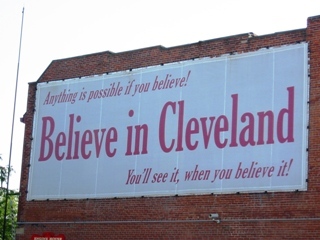 The city was once called the Mistake By The Lake; today, thanks both to a great ballpark and Drew Carey, everyone can sing “Cleveland Rocks”. There are several other attractions not far at all, like the Rock and Roll Hall of Fame (which is finally legit with the induction of Rush and Chicago), the Science Center, and a very happening nightlife scene between the ballpark and the other attractions. They even got their football team back. 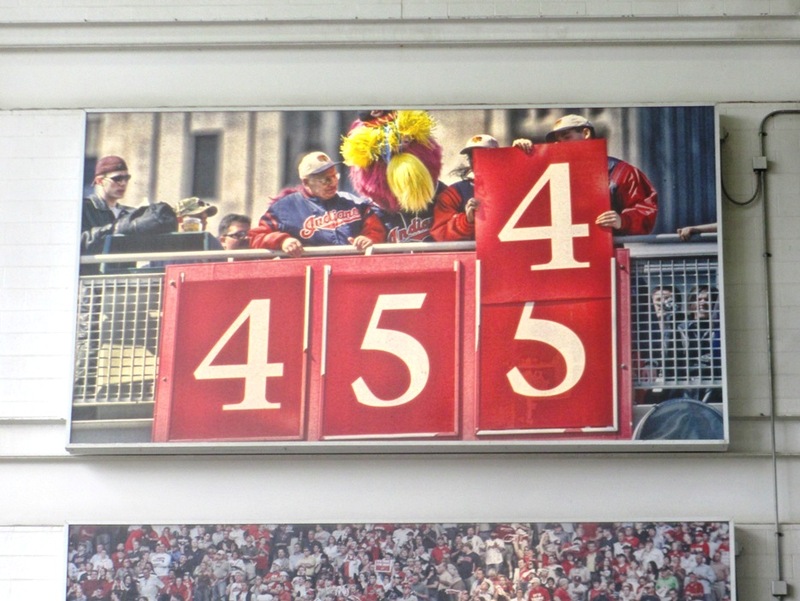 There you go, five tips for visiting Progressive Field in Cleveland. Oh, don’t forget to bring the kids, too…they have a brand new multi-level play area in right field, and unlike most ballpark play areas, the parents can watch the game from there. It’s a win-win. Want to know more about Progressive Field? Sign up here for my completely free Progressive Field e-mail newsletter series, and score some seriously valuable info about tickets, seating, transportation and food…see you at the Yard! Enjoying the cool Indians game tips? Sign up today for the absolutely free Ballpark E-Guides Progressive Field newsletter!